Orangeries have become increasingly popular in recent years, a wide range of companies now construct them, using a variety of materials and approaches. At the lower end of the market, several conservatory roof manufacturers have developed pre-fabricated uPVC orangery roof systems that are designed to be quick, easy and cheap to fit, but are little more than a conservatory roof with some plastic fascia. Whilst they clearly have their place, they are lacking in authenticity, substance and taste. These systems are generally designed to be exempt from building regulations, are restricted to standard sizes and are unlikely to add much value to the property. 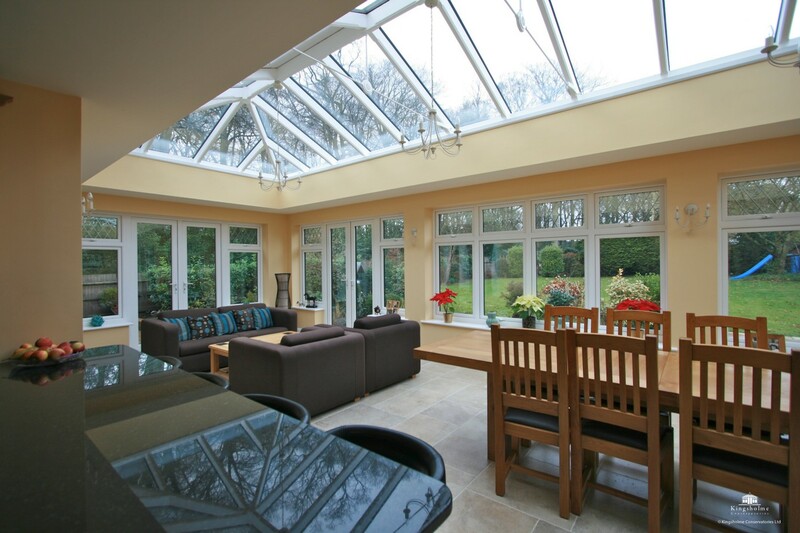 Our orangeries are built to the same construction standards as a traditional extension, but allow in a greater amount of light and are more aesthetically pleasing. Costs vary, but they will generally add more value than an traditional extension as the orangery and adjoining rooms will benefit from greater levels of natural light. In most cases, orangery foundations will need to be approved by a local authority building inspector. For more detailed information on orangery foundations click here. Currently building regulations exceed past building standards, therefore it is not uncommon for us to put in deeper foundations than those on the existing building, particularly where there is clay in the ground and trees are nearby. In some instances, piles are the most economical solution. Due to the increasing number of instances where this proved to be the case, we have invested in some mini-piling equipment. This is ideal in restricted access situations and/or where very deep excavations are required. Whilst masonry is capable of bearing enormous downward loads, narrow piers and sections of brickwork generally do not possess much lateral strength. However, it is often desirable from a design point of view to incorporate narrow masonry piers to increase the proportion of glass. Where required, we use a steel portal frame to strengthen the brickwork and the overall building. Orangery roofs are essentially big flat roof with a hole in the middle for the glazed lantern. This sounds simple, but they are one of the more complex types of roof to construct. To form the structural opening, we generally use Glulam beams. These are lighter and better insulated than steel, allowing us to span over ten metres without the need for expensive lifting equipment. We typically use Sarnafil to cover the flat roof area of our orangeries. More details on Sarnafil. The roof is laid to slight falls, which are typically hidden behind a decorative fascia or brick parapet. Rainwater outlets are strategically positioned and whilst they are normally 100mm (4″) in diameter and easily accessed, we usually supply leaf guards to prevent blockage. The flat roof area can can be walked on, which makes maintenance of the existing property far more practical than with other options.